Why don't they wind up ? As I said in my presentation on Globular Clusters, as amateur astronomers, we spend a fair bit of our telescope time looking at members of the Messier Objects. Of these, perhaps the most visually engaging objects to observe with an amateur telescope are the Spiral Galaxies. Who among us hasn’t returned to gaze at face-on M51 or oblique M104 time and time again ? However, how often did you ask yourselves : What exactly are the arms of spiral galaxies ? How did they form ? Why are they still there ? I’ve been puzzled by spiral galaxies for a long time. Think about it : spiral galaxies are not rigid disks like bicycle wheels. Stars in their cores orbit the galactic centre faster than those at the galactic edge. Given enough time, the spiral arms should wind up like threads on a spinning bobbin. Remember, galaxies (including spirals) are old – billions of years old – so they’ve had more than enough time for their arms to wind up and disappear. Yet, they haven’t done so. Why not ? It’s a simple enough question, but – as I asked for globular clusters - what’s the straight-forward answer ? Statistics !! Well, as an answer to a fundamental question, that’s not very helpful , so I’m going to try to explain it here in words we can all understand. Nevertheless, the concepts we are going to examine are not trivial : they are not simple. I can render them understandable, but you may have to bear with me for a bit. Most importantly, we need to understand one thing before we start. No-one knows how spiral galaxies form … and no-one can provide an all encompassing answer to the question about why their arms don’t simply wind up. So, I won’t be leaving you with a simple straight-forward answer at the end of this presentation, but you will have a good idea of where things are at today in the minds of cosmologists who study the question. Why are we as amateur astronomers even asking the question – “how do spiral galaxies form and why don’t they wind up?” – if the answer is “no one knows” ? Quite simply because 70% of all galaxies are spirals, and amateur astronomy is more than just looking at objects and checking them off on a list : we want to understand the universe ! So let’s start by reminding ourselves what spiral galaxies actually look like. Spiral galaxies come in a number of shape classes, defined according to the number of spiral arms they contain and the disposition of those arms. Here’s what’s referred to as a Grand Design barred spiral galaxy. What do we see ? : two curved arms describing a spiral shape. According to the model whereby the galactic core rotates faster than the outer parts of the arms, this galaxy rotates anti-clockwise. The curved arms remain pretty close to the core of the galactic disk, so we would describe this as a tight Grand Design spiral. BTW : it’s a common error to assume that the spiral arms are separated by empty space. Apparently there are lots of stars between the arms, with only about 10-20% more in the arms making them look brighter ! The core or bulge of this galaxy is clearly elongate, with the two galactic arms attached to its ends. How exactly galactic bars form is pretty complex stuff, but we can easily understand what a central bar is. Statistically speaking, stars in a non-barred spiral galaxy move around the galactic centre on approximately concentric circular orbits. Stars in the bar of a barred spiral galaxy move on tight ellipses whose long axes are approximately parallel to the length of the bar. What this means is that the circular component of a star’s orbit in a galactic bar has decreased and been replaced by a radial component : radial to the centre of the galaxy. Just how this happens is another story ! Grand Design spirals are iconic, but they comprise only 10% of all spiral galaxies. The vast majority are multi-arm spirals, or flocculent spiral galaxies. Flocculent (“fluffy” galaxies) – such as M63 – are 3 times as common as Grand Design spirals. They have so many, indistinct arms, each with multiple knots of star-forming gas, that arm numbers become very difficult to count. Multi-arm spiral galaxies are twice as common as flocculent spirals. Here’s the iconic multi-arm galaxy M33. The arms are very obvious, but sometimes it’s difficult to know exactly where some of them root. Do they stem from the galactic bulge, ... or do they branch from other arms ? As we’ve already seen, some 30% of galaxies are not spirals at all : they are elliptical galaxies. Here’s M60 adjacent to a neighbouring spiral galaxy for comparison. Ellipticals, despite their name, are commonly spherical in shape. As opposed to the simple stellar orbits of spiral galaxies, stars in ellipticals buzz around on random orbits, similar in principle to what we saw in my presentation on globular clusters. In the early 20th century, when Irwin Hubble was working out galaxy systematics, he speculated that elliptical galaxies were primitive and that they evolved through time to become disk-like Grand Design or multi-arm galaxies. He was wrong at the time, and this diagram that you will still find all over the web is still wrong. It turns out that some of the oldest known galaxies are spirals, and the best development of ellipticals seems to occur at the centre of large clusters of elliptical galaxies, suggesting that they themselves form by the accretion of smaller elliptical galaxies. Today, no-one claims to have solved the global question of how galaxies form, but cosmologists are asking new questions : Do spiral galaxies coalesce to form ellipticals, rather than the other way round ? Rather than forming via sequences, are elliptical and spiral galaxies the result of intrinsic factors ? For example, do different galactic shapes correspond to different densities of star content ? Does faster galactic spin favour spirals over ellipticals ? Now that we’ve examined what galaxies look like and some history of the scientific thinking, let’s start to look at some of the modern thinking about how they might form. Before we do that, let’s look at a very simple – geometrical - way of drawing a spiral. Remember : we’re looking at a shape – or a geometry – not how it formed. Start with a set of concentric circles, that we then somehow distort into a set of concentric ellipses. Now rotate the ellipses, such that the central ellipse rotates more than the next enclosing ellipse … and so on out to the exterior of the set. Look at the geometrical result. What we have drawn is a Grand Design spiral with two arms and a central bulge, and we did this by differential rotation of the galactic core compared with the galactic rim. However, our spiral shape is defined by the material that makes up our model galaxy : in this case - ellipses. Technically, we would say that the arms of the model spiral galaxy here are attached to material points : in this case - the points of ink that trace out the ellipses. Watch what happens when an homogeneous, radially symmetrical, rotating disk (yellow) is gravitationally disturbed by the presence of a much smaller close neighbour (blue). The rotating (yellow) disk quickly and spontaneously develops a spiral structure that resembles a Grand Design spiral galaxy. So what’s the problem ? All we have to do is to disturb a rotating disk of gas and we get a spiral ! Well, yes, but now we have a problem of kinematics : a fancy word that refers to how things move. Here’s the problem - if the arms of a spiral galaxy are material i.e. they always contain the same stars (attached to material points) – then they must wind up as the galactic core rotates faster than the outer parts of the spiral arms, but they don’t !! We can refer to this as the “winding problem”. So, geometry informs us of the shape of spiral galaxies, kinematics presents us with the winding problem, and dynamics (what makes things move) will hopefully provide us with a possible solution to the question “why don’t spiral galaxies wind up?”. So, let’s take a look at galactic dynamics. If we start with a rotating ball of gas and dust, angular momentum will lead to a flattening of that ball into a rotating disk. Within that galactic disk, gravitational interaction between the stars of the disk will induce the inner parts of the disk to rotate faster than the outer parts, leading in turn to shearing between galactic segments that are moving at different speeds. Now, these three components – rotation, shearing and gravity – somehow combine to form spiral arms. But how ? Early ideas and analogies all saw the spiral arms as attached to material points, i.e. the material in the arms (stars) stayed in the arms. However, the arms of such a galaxy would soon wind-up after a few galactic rotations : something on the order of a 100 million years or so. So, why can we still see spiral structure in galaxies that are up to ~13 billion years old ? Statistics ! When we looked at globular clusters in a previous presentation, we saw that cosmologists treat the behaviour of the stars in the cluster by analogy with the behaviour of molecules in a gas. We don’t need to track every molecule in the gas to understand the behaviour of the gas : we work with a statistical approximation of what the gas molecules are doing. Modern cosmologists take a similar statistical approach to the study of globular clusters … and to spiral galaxies. In this statistical approach, cosmologists treat the spiral arms of galaxies as density waves. What they mean is that there are two different speeds they have to take account of : the orbital speed of stars around the galactic centre, and the rotational speed of the spiral arms - referred to as the “pattern speed”. Since these two speeds are not the same, stars do not remain in the spiral arms : they pass through them. Hence, galactic spiral arms are NOT attached to material points. In fact they represent waves of more densely packed stars, compared with the less densely packed stars between the spiral arms. Which goes faster – stars or the spiral pattern – depends on where you look. Stars in the inner part of a galaxy move faster than the pattern speed - so they move through and ahead of the arms - while stars in the outer part of a galaxy move more slowly and fall behind the spiral arms. Well, this is great because if the arms are now a function of statistics and are not materially fixed, then we’ve just solved the windup problem … or have we ? Unfortunately for us – no, we haven’t. It’s more complicated. It turns out that if you let this model run on a bit in the computer, the inner parts of the spiral arms migrate inwards and the outer parts migrate outwards - and the arms basically disappear. It turns out that the same gravitational interaction within the galactic disk that leads to the inevitable disappearance of trailing spiral arms acts on leading arms to make them migrate outwards and to amplify very fast. Look at the inset of the Grand Design spiral galaxy in this slide : the galaxy rotates anti-clockwise, so we would describe the spiral arms as trailing behind the rotational motion of the galactic core. Let’s be clear here : the arms of mature spiral galaxies are trailing arms. However, as a galactic disk is just getting going – before the arms have developed – the disk is a statistical mess, full of clumps and clusters of material. Remember, cosmologists are not tracking individual bits of galactic material : they are statistically analysing them. What does this mean ? Here I’ve drawn some small blue circles in the same colour as the large circle on the right. The big circle is our rotating juvenile galactic disk, and the small circles are undifferentiated clumps of “stuff” in the galaxy . “Stuff” could mean stars, or it could mean molecular inter-stellar clouds. It doesn’t matter because for the cosmologists the small circles just mean “mass” - and mass has gravity. These small clumps of blue “mass” are scattered throughout the model galactic disk by the billions, and I have chosen to artificially blow up two groups of blue mass for the purpose of illustration. Most of the small circles of blue mass in my model galactic disk will be randomly distributed, but some – by statistical chance - will line up. Cosmologists call these aligned masses “perturbers”, and we’ll see why in just a minute. It turns out that “perturbers” oriented in the leading position with respect to the overall rotation of the galactic disk will grow (amplify) and grow fast (hence the “+” symbol), while those oriented in the trailing position will decay (“-“ symbol and a big red “X”). As they grow, the leading “perturbers” increase in mass and gravitational influence. Leading “perturbers” then begin to coalesce and make even bigger leading “perturbers” and - as they grow - they create gravitational disturbance in the other parts of the galactic disk. As we have already seen, all it requires is a perturbation – or disturbance - to get a rotating disk to form spiral arms … even if they may not last very long. Well, that’s the role of our leading “perturbers” here : to perturb and disturb the galactic disk. ​So, now we have a universal disturbance generator within a model galactic disk, with disturbances of galactic material (mass) that grow in a linear fashion and amplify to form the seeds of galactic arms. Trouble is, they’re pointing the wrong way ! That’s where the differential motion between the faster rotating inner parts of the galactic disk and the slower outer parts comes in, producing a shearing action within the galactic disk that now “swings” the amplifying “perturbers” against the overall rotation of the galactic disk – and into the trailing position that we expect to see them in through our telescopes ! … and the arms appear to be stable, for statistical reasons I won’t get into here. 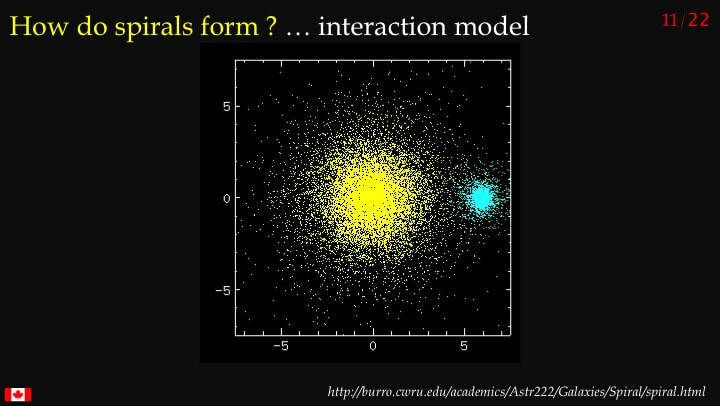 OK : so do we now have a universal model for the formation of spiral galaxies ? No … Why not ? Because “swing amplification” on its own tends to generate Grand Design spiral galaxies with only two arms. What about the other 90% of spiral galaxies ? Until quite recently, this is pretty much where cosmological modelling of spiral galaxies stood. As computers got more powerful, cosmologists found they could put in more and more objects into their statistical models. They could play around with different ratios of mass in the galactic core versus the galactic disk, and they could produce some realistic looking multi-arm spiral galaxies. The problem was that these models all used linear mathematics. What do I mean by this ? : I mean linear as opposed to non-linear. Linear is obvious – we learn it in primary school. Non-linear is math by geometrical progression or logarithmic progression. If you introduce the square of a number into the math, the result grows much faster than in linear math. However, computers have to work all the harder in non-linear math, so cosmologists were only able to make non-linear models very recently, as computers became powerful enough to handle non-linear galactic models. So in 2013, a paper was published describing one of the first non-linear galactic models to be run. It was a statistical model, populated with random molecular clouds that acted as local-scale “perturbers” generating local disturbances : self-gravitating “wakelets” – effectively a wave or concentration of mass – that then became gravitational “perturbers” in their own right. This process continued as the “wakelets” amplified and - where they were appropriately aligned (leading) – merged to form an arm. The “wakelets” are very small – so don’t look for them in this image – and they grow while undergoing “swing amplification”. The key thing to understand here is that the “wakelets” are not eternal. They can decay and be replaced by others. In other words, a spiral galactic arm is statistically stable, but is dynamically in a constant equilibrium state of growth vs decay. Most importantly, this non-linear model results in galaxies whose spiral arms are still statistically stable even after the original molecular clouds - the original model “perturbers” - have been removed from the model (turned into stars). So, do we now have a universal model for the formation and stabilisation of spiral galaxies ? No … Why not ? Look at the resulting galaxy in this model run. This is NOT a multi-arm galaxy (60% of all spiral galaxies) : it’s a flocculent galaxy (30% of all spiral galaxies). So more than half of spiral galaxies in the universe remain unaccounted for by all this modelling ! I told you at the outset that I would not be able to leave you with a straight-forward answer to the question of how spiral galaxies form and how they keep their shapes. But I hope I’ve given you some idea of the kind of thinking that cosmologists are engaged in today. They have made excellent progress with this inherently complex problem, but they’re still a long way from a single, all encompassing model for the behaviour of spiral galaxies.